We spent Sunday at a lovely vineyard in southern New Jersey celebrating the wedding of our niece Jessica to her longtime boyfriend Brandon. Jess had wanted wedding pie instead of wedding cake, but deferring to tradition (and her mother), compromised with wedding cupcakes. So yesterday, in honor of Jessica (who, in addition to just finishing medical school, makes a pretty mean pie herself), I baked a rhubarb pie, with rhubarb purchased at a farm stand we passed en route home on Monday morning. 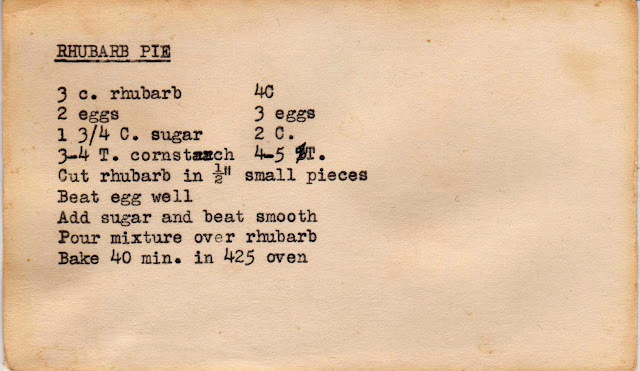 Rhubarb used to be called pie plant; indeed, pie filling the most common use of this tart vegetable. 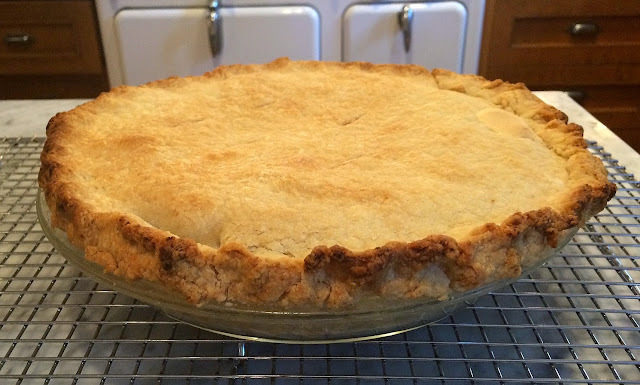 I was intrigued by this recipe which, unlike most rhubarb pie recipes (this is one exception) calls for eggs, adding a richness to the filling. It's very good and not too sweet (despite two cups of sugar) and not at all custard-y, which I would have expected with three eggs. I'm guessing the recipe dates from the late 1940s or 1950s, when eggs were not all that dear, as they were during WW II. 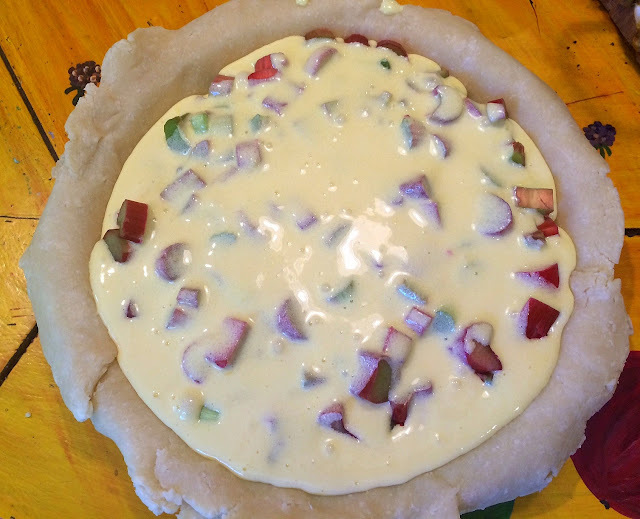 First, make the pie crust (directions at the end of the post). 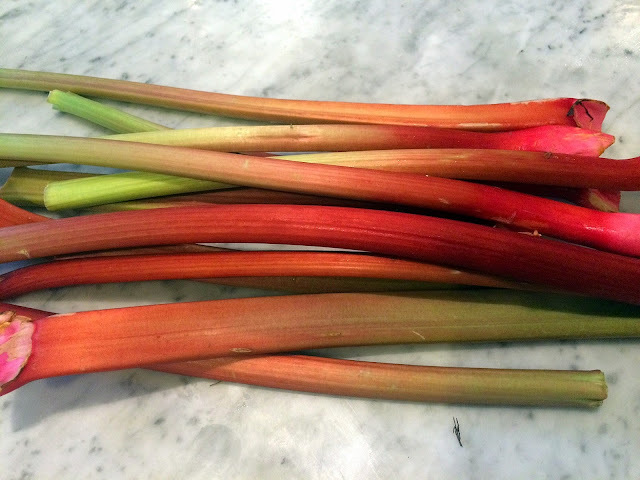 Next, wash some farm fresh rhubarb. 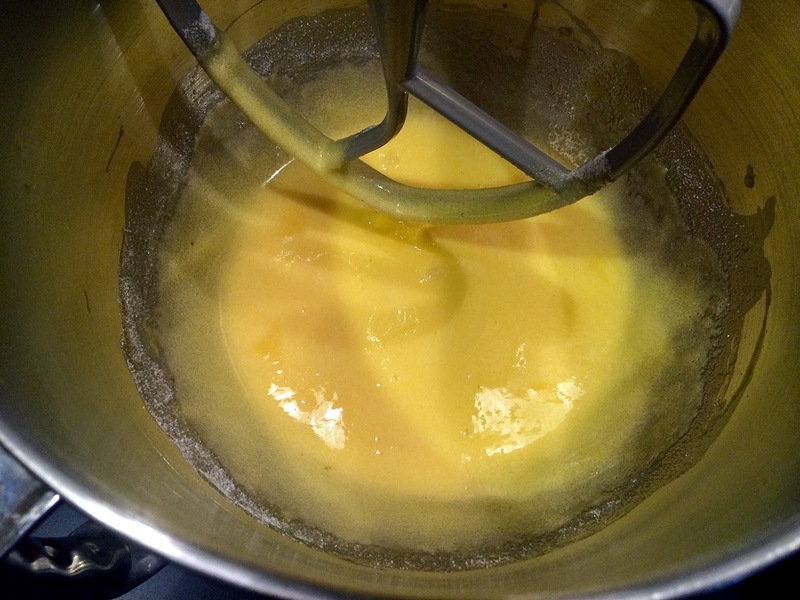 Mix the eggs and add the sugar and cornstarch. 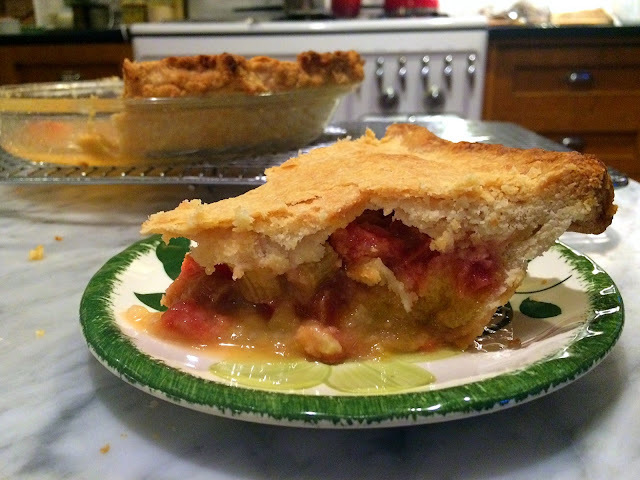 Place the cut rhubarb into an unbaked pie shell and pour the batter over it. Lay the top crust on, crimp the edges and vent by making a few slits using a sharp knife. Bake at 425 F for 40 minutes or so. If the edges start browning too quickly, cover with some aluminum foil. 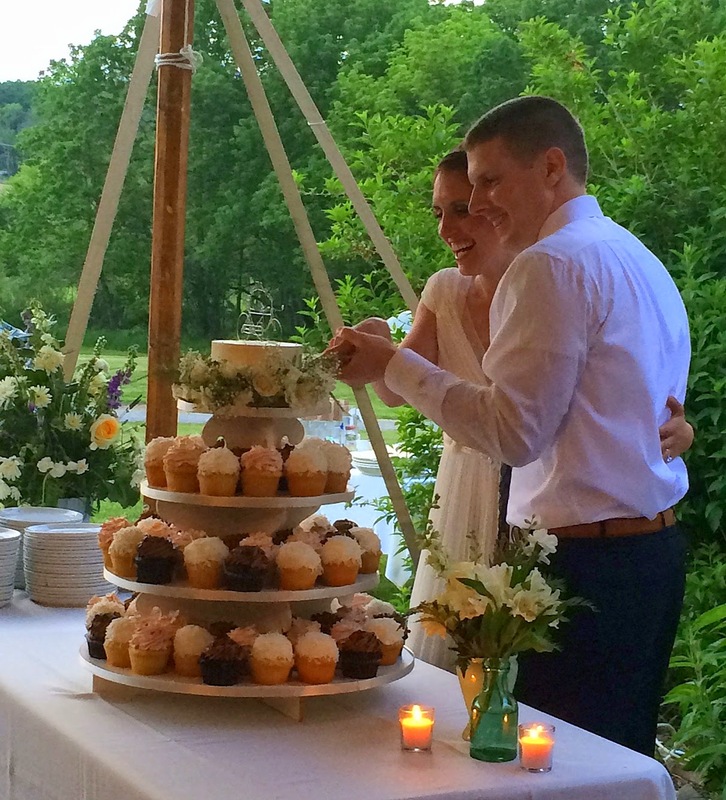 Jessica and Brandon cutting the wedding cake -- they did have a six-inch cake atop the cupcake display. 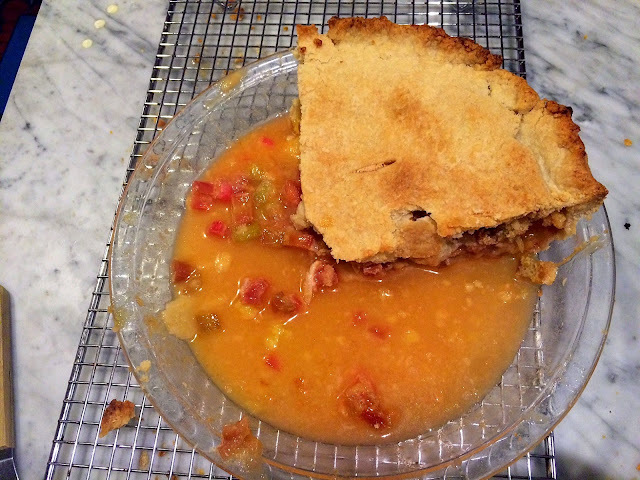 Note that the recipe says not a word about a pie crust. 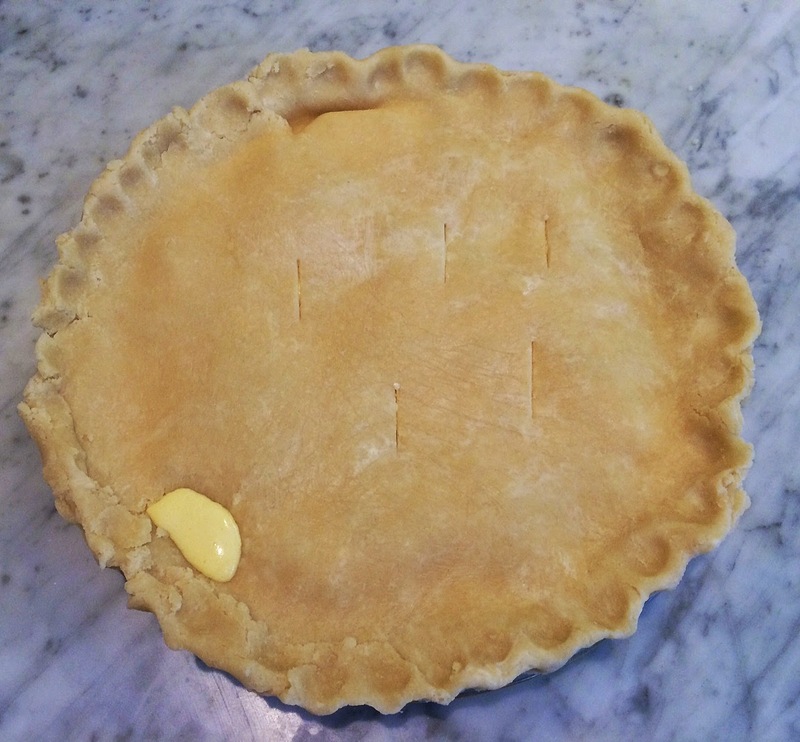 Perhaps it was meant to be a single crust pie, like this one and the filling would have been more custard-like. In fact, looking at the recipe now, I think that's what the recipe author may have intended. Oh, well. Just part of the fun of baking from old recipes! And below, truth in baking. The too-liquid-y filling. But when the pie was cut into slices, it was just fine, as you can see from the photo at the very top. This is very close to a recipe my husband uses (he found it on a website called the rhubarb compendium in 1999, acco. to this stained webpage printout). I have also made it many times. Always as a one-crust. The only difference is that his recipe calls for 3 tablespoons of flour instead of cornstarch (he ups it to 4 tablespoons) and 1/4 cup less sugar. 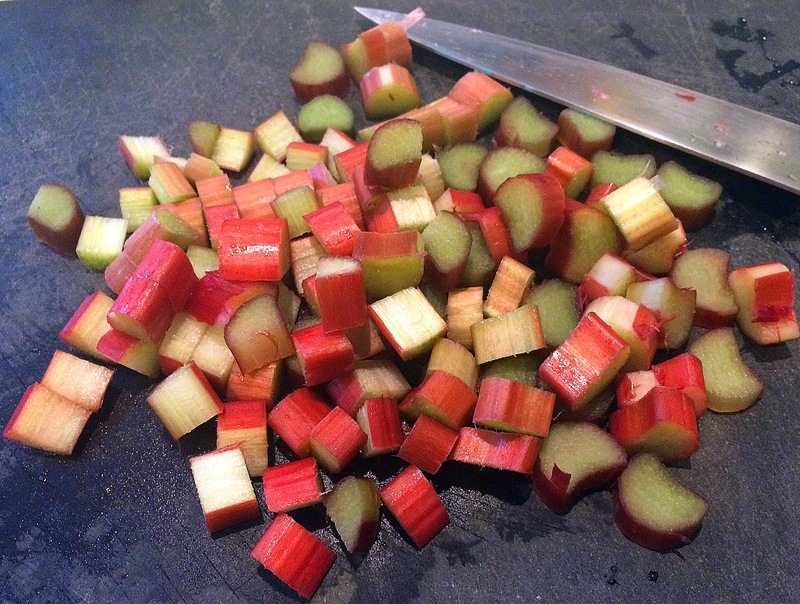 My husband's innovation was to substitute 1 1/2 bananas (not too ripe) for a cup of the rhubarb. This may solidify it even more. It's very tasty. Your crust is what catches my eye, it is beautiful!